We are looking for donors to establish an International Learning Centre in the UK, which would provide future generations with an opportunity to remember and learn the lessons from Srebrenica. Remembering Srebrenica is looking for donors to help us establish the world’s first International Srebrenica Memorial Learning Centre. There is a need to establish the world’s first International Srebrenica Memorial Learning Centre to combat hatred and intolerance through leadership engagement, commemoration and educational activities. The Centre will work to combat hatred and intolerance through using the lessons from the Srebrenica genocide. These lessons will not only heighten awareness of the dangers of intolerance in the contemporary world, but bring to the fore an appreciation of respecting religious beliefs and upholding universal values. In this way the proposed Learning Centre will offer a powerful antidote to prejudice and act as a beacon of shared humanity by creating 50 million opportunities for people to view our messages globally, creating at least 10,000 champions against hatred and attracting at least 25,000 visitors to the centre each year. 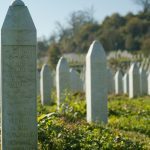 The Centre will use the history of the Srebrenica genocide as a model of how society can break down, and emphasise how current and future generations must carefully examine and learn from this tragedy. The ‘Lessons from Srebrenica’ educational visits programme will continue through the centre in order to promote an understanding of the dangers of hatred and intolerance. Through the work of the Centre, we will promote the importance of building community cohesion and good citizenship, which has greater resonance than ever in our culturally diverse global societies. The International Learning Centre can be established and self-sustained by raising £6.9 million. That means that if we can find 7,000 people who each donate £1,000, we will reach our target. Anyone giving a donation of £1,000 or more will have their name inscribed on the wall as a founder of the centre, but donations of any size are very welcome. Send a cheque payable to ‘Remembering Srebrenica’.